When people think of industrial VFDs, they typically picture some type of enclosed device, usually with a small display that shows several 7-segment digits and a few built-in pushbuttons. A user routinely has to go through 50 or so parameters on each install to program the VFD specific to their application. Having this type of flexibility allows the VFD manufacture to make one control that can be used by many different OEMs for a wide variety of applications. However, having this much variation can be daunting to the average user who just wants to make a motor spin without the headache of programming and troubleshooting. Especially if the 100+ page manual has been lost or the password has been forgotten. That's why many of the VFDs from American Control Electronics mimic the classic DC control setup, just a few trim pots that can be used to calibrate a handful of intuitive settings. After all, many users might have used DC controls in the past and have only recently migrated to AC. But don't let the ease of use of our VFDs confuse you! 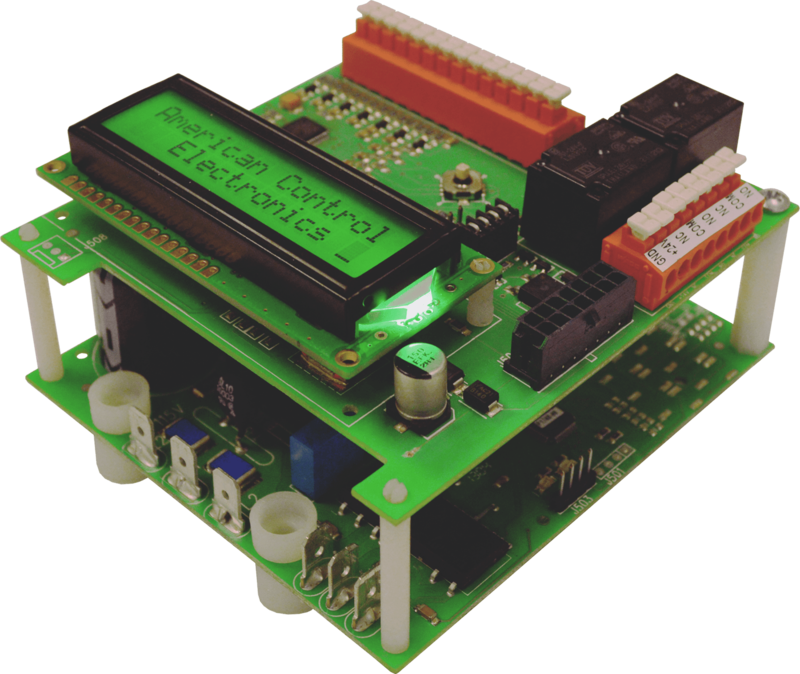 American Control Electronics can design customizable display-based VFDs. The image above is a VFD that ACE designed specific for an OEM. Instead of creating a program that allowed a user to change any and all parameters, ACE created a menu-driven program specific to the OEMs application so that the installer only had access to the parameters that the OEM allowed. As with many of our customs, the VFD is doing much more than turning a motor shaft in this application however. The VFD is integrating several sensors and inputs to make decisions that are usually delegated to a PLC. This includes things like cycle times, delays, making decisions on obstruction types, and pre-programmed routines. Our menu-driven VFD not only displaces a standard VFD and touchscreen interface, but also the PLC and external relays, while also communicating via Modbus to other ACE menu-driven VFDs so that all systems work in harmony. The custom solution VFD from ACE not only saved the OEM money by negating the need to buy a PLC and external components, but also in the manufacturing time. It also allowed the customer to not only condense their system into a smaller package to give them a competitive advantage, but the custom programming gave them a competitive edge in their market.